Forget milk and cookies. Give Santa what he really wants with this Easy Eggnog Recipe. Rich, creamy and a delicious alternative to cookies…again! With all the stresses and goings on during the holidays, I’ve been in search of something to help lower my blood pressure and get me back on an even keel. The stresses of the holidays aren’t going to relent for another week, so I’ve been looking for a little something to not only enjoy and indulge on but also help break the cycle of stress and take the focus off of my never-ending to-do list. No other drink says “the holidays are here” quite like eggnog. I’ve always been a fan of the flavor but have usually been able to restrain myself. But not this year. This recipe was sponsored by International Delight Nog at H-E-B. While International Delight no longer makes the Nog flavor, you can easily swap out other flavors (hello, Frosted Sugar Cookie) of International Delight or just use regular eggnog instead! It occurred to me, I’m usually not big on milk or milkshakes but adore me some eggnog. So while enjoying a class this year, my mind started drifting to Santa. This guy always gets stuck with the same old cookies and milk year after year. So if I like a change of pace from time to time, maybe Santa would like one as well. And instead of cookies, maybe taking that eggnog a step further and transitioning it into another favorite holiday treat would be delicious as well. 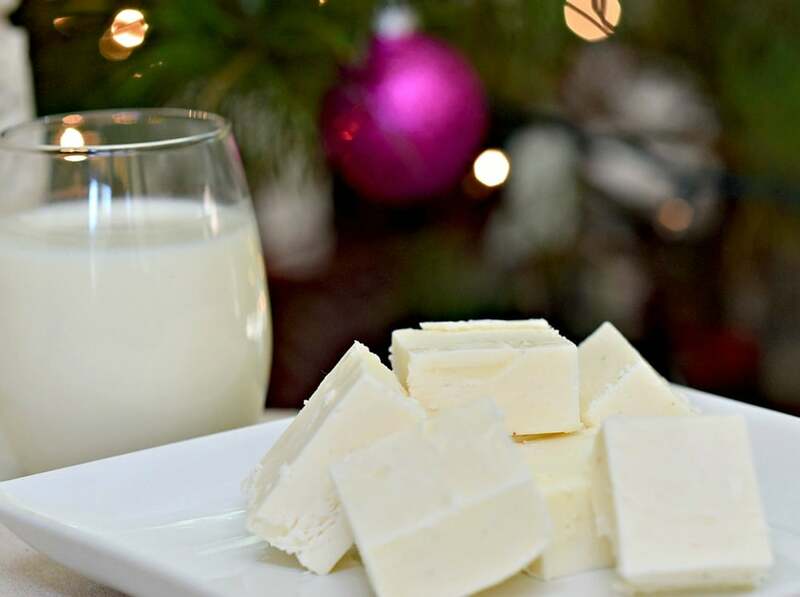 So this year instead of cookies and milk, try this easy eggnog fudge recipe instead! Place medium saucepan over medium heat and melt butter. Stir sugar, egg, vanilla extract and rum into the mix until it’s achieved a smooth, thick consistency and bring to a boil. Continue cooking, stirring constantly until the temperature reaches 234 degrees (soft ball stage for candy making). Turn off the heat, but leave on the hot burner. Slowly mix in the white chocolate chips until they are completely melted and smooth, then add in the marshmallow creme and continue stirring until fully blended. 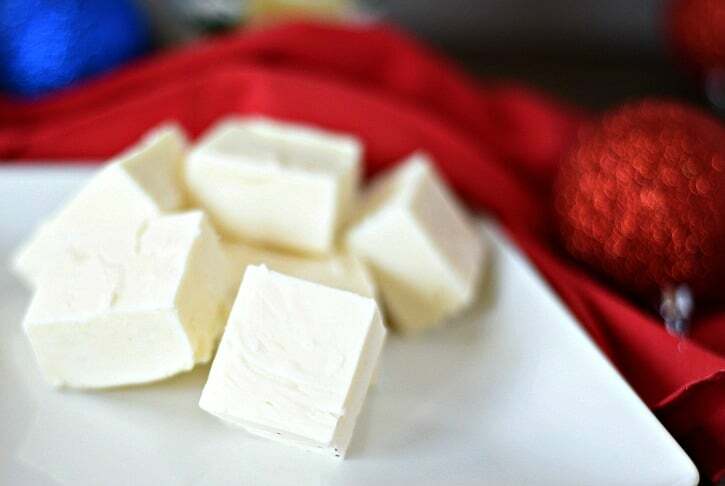 Lightly spray, butter, or line an 8x8 baking dish with wax paper and pour fudge mix inside. Refrigerate overnight or until mixture is set and not jiggly. 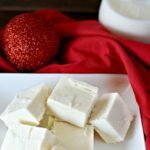 If you love fudge, you’ll also want to check out this simple peanut butter fudge! It melts in your mouth! 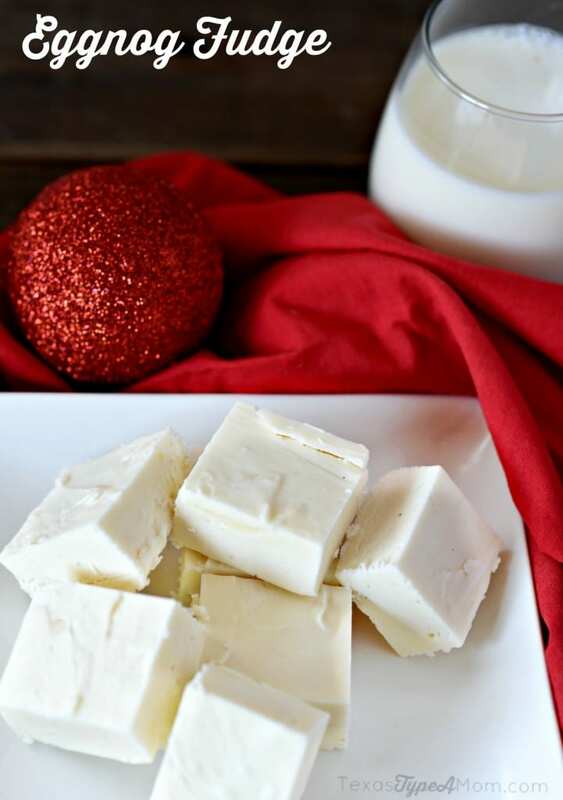 This eggnog fudge recipe is perfect for a Christmas cookie exchange…or dessert exchange!